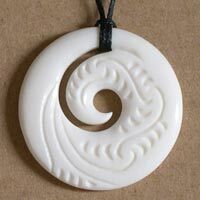 Maori Designs Symbols Meanings, Koru, Manaia, Twist and Hei Matau. This page provides the basic meanings of some popular Maori designs or symbols. The meanings provided are the result of many books and web pages of information, and as such is as accurate as we were able to get it. Some meaning's will not agree with every tribal interpretation as not all interpretations are exactly the same. 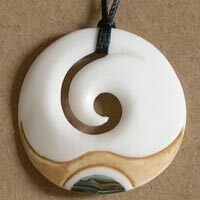 These Maori Designs are the Koru is the Beginning of Life. The Maori have taken their symbolism from the unfurled new leaf of the silver fern. It depicts new beginnings, growth and harmony. New Zealand is the home of the most beautiful ferns in the world. These Maori Designs are the Hei-Matau and is the fish hook. It symbolizes prosperity. Much of Maori traditional food is fish. The fish were so plentiful to the Maori that the simple ownership of a fish hook meant prosperity. Today it also represents strength, determination and good health. It provides safe journey over water. The carrier of supernatural powers. The circle of life which includes the path of life ever ongoing, with no beginnings and no end. It also represents inner harmony and balance. The Tiki is commonly known as a good luck charm (Hei meaning to wear around the neck). 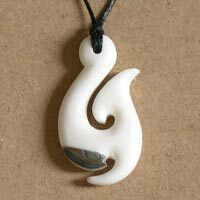 these Maori designs are considered a symbol of fertility. The wearer of the Hei Tiki is assumed to be clear thinking, perceptive, loyal and knowledgeable. Their strength is their character. The Tiki is a talisman of New Zealand and her Maori people. From ancient times it has been regarded as a good luck charm. It is widely believed that it represents the unborn human embryo. 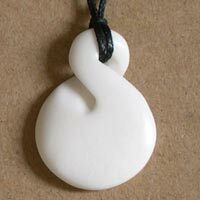 And in Maori culture this represents a particularly powerful spirit for warding off bad luck. Years ago the most valuable tiki's were hand carved from greenstone. They were handed down through the generations and are treasured New Zealand Souvenirs today. You can still get such tiki's and start your own cycle of good luck. Drop: Indicates strength, independence, unity and pride. Often called a comfort stone. Heart: Indicates love, emotional balance, compassion and generosity. Adze: Signifies strength, control, determination and focus. Teardrop: signifies reassurance, positive energy, healing and comforting. Dolphin: A symbol of protection. Dolphins in large schools often attacked sharks that got to close to canoes. Shows affinity to nature, especially the sea. A free spirit. Today the dolphin represents protection on all forms of transport. Whale Tail: Another symbol of protection. Many whales in an area often meant an absence of sharks. Shows empathy for conservational issues. Strength but sensitivity. Today the Whale represents protection on all forms of transport. Stairway: To assist you in your spiritual journey. Adze: Signifies strength and honer and a tremendous amount of determination. Turtle: The sign of the Turtle is the symbol of the sea navigator. Some Maori legends claim the origins of Tuna (the eel), is from the heavens known as Orukateraki. Tuna was one of the lesser Maori deities, the son of Manga-wairoa. Legend says there was a drought in heaven, and after meeting Tawhaki, a man who travelled from earth to the heavens, Tuna decided to descend to the earth (Papatuanuku) in search of water. He found a cool place in which to live called Muriwaiowhata. Maui (a great demi god in Maori mythology) and his wife Hine lived close to Tuna's pool. In Maui's absence Tuna would come up out of the water and ravish Maui's wife. Upon hearing this Maui laid logs between his hut and the river and there lay in ambush. At night Tuna came gliding over the logs to see Hine and Maui slew him. Maui scattered the pieces of Tuna. The tail produced the various types of fresh water eels, and his head produced all the varieties of salt water eels that inhabit New Zealand (Aotearoa) to this day. Tuna is a symbol of youth and new beginnings. The Tuatara (native to New Zealand) is the only living fossil in the world. All of its relatives died over 60 million years ago. Tuatara are reptiles and therefore cold blooded. They shed their skin like a snake once a year, can regrow their tails, range in colour fro green to brown to orange, can change colour over their lifetime and can hold their breath for nearly an hour. They live on average for 60 years (some have been recorded over 100 years old). Males with the distinctive crest of spines along their back reach 600mm in length and weigh about 1.5kg when fully grown. Females are smaller and reach sexual maturity at 15 to 20 years of age. They mate every 2 to 5 years there after. 9 Months later she will lay 6 to 10 eggs and in another 12 months the baby Tuatara will hatch. They are nocturnal, preferring to forage for food, mainly insects, lizards, sea bird eggs and chicks at night. Tuatara feature in a number of Maori legends and are held as Ariki (god forms). Today, Tuatara are regarded as a Taonga (special treasure). It is important to note that the figures in Maori carving, with rare exceptions, are not religious, but secular. They do not represent the idols, but renowned ancestors (tipuna) of the tribe. The Wheku is found at the apex of the gable on the front of a large carved house, symbolises an important ancestor after whom the house was named. The house itself represents his body. The sloping barge boards between his arms (maihi), the rafters (heke) being his ribs and the inside being his stomach. The head is usually represented on its own with no part of the body visible. In old houses it is actually carved on the projecting end of the ridgepole (tahuhu), and the body of the figure will be seen on the ridgepole. There are many tribal variations in how the head is represented. The three main styles of head in Maori carving are: the Wheku, the Koruru and the Ruru, each distinguished by the shape around the eyes. New Zealand Souvenirs Images and Information copyright © 2006 - 2019 by Simply Souvenirs Ltd. All rights reserved.